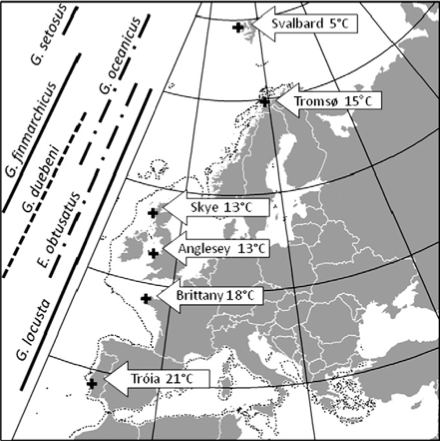 In order to examine the physiological capabilities of marine invertebrates in their natural environment, a series of physiological measurements were conducted on congeneric amphipod species (Genus Gammarus) distributed along a natural thermal gradient in the NE Atlantic and Arctic Oceans. This synoptic paper summarises our most recent findings by describing physiological differences within and between Gammarus species collected from the intertidal between Portugal at 38N and Svalbard at 79N. Two physiological variables were examined to include temperature-adaptive responses at two different levels of biological organisation: (1) whole animal responses by measuring oxygen uptake rates as a measure of metabolic rates or costs of living; and (2) molecular responses by examining sequence variation in two functional regions of the myosin heavy chain gene (loops 1 and 2) which influence muscle contractibility. Our initial observations on Gammarus species showed that physiological variation as a function of latitude was species-specific. For instance, the sub-arctic/boreal species Gammarus oceanicus did not compensate its metabolism at polar latitudes. Instead, metabolic rates declined with latitudinal changes in temperature resulting in relatively low rates of metabolism in the sub-arctic population. In contrast, the boreal and temperate species G. locusta and G. duebeni duebeni conserved metabolic rate across latitudes indicating a capacity for physiological compensation. A similar response was observed at the molecular level as sequence diversity in the loop 2 region of the myosin heavy chain gene remained unchanged with latitude in G. oceanicus but increased with latitude in G. d. duebeni which was attributed to differences in thermal habitat. Further work is required to establish whether these physiological differences involve local adaptation or are dependent on phenotypic plasticity. These findings provide valuable information on the ability of each species to adjust their physiology to maintain function despite increases in temperature due to global warming.